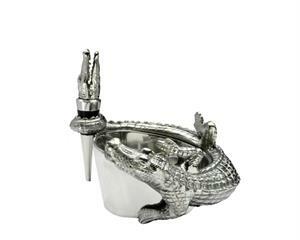 Talk as much about the barware as the drinks themselves with Arthur Court's Alligator Wine Coaster and Stopper Set. A scaly-patterned alligator wraps its body around the coaster in a warm embrace, winding its tail up the side to form a circular hold for the stopper. An alligator head opens its jaw slightly as it looks skyward atop the stopper, completing this handmade, aluminum set. Size: Diameter: 4.0" / Height: 3.5"